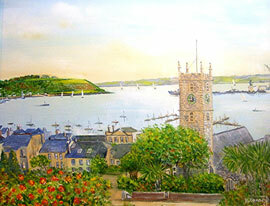 Falmouth is an ancient sea port, long steeped in seafaring tradition. It is the most southernmost port in England, where during the majestic age of sail cargoes would find the best markets in Britain. A regular instruction to English merchant ships bound for Europe, following the long voyage from the Indies or Americas was to "sail to Falmouth for orders". Occasionally, messengers and ambassadors travelling to London would be dropped off at Falmouth, because in those days one could ride to the capital faster than a ship could tack against the wind up the English Channel. One such case is when News of the victory at the Battle Trafalgar and the death of Nelson reached Falmouth first, and was then taken to London by Stagecoach. Falmouth port stands at the entrance to Carrick Roads, a magnificent natural harbour formed by the junction of seven estuaries. The castles of Pendennis and St Mawes, which face each other across the bay, were built by Henry VIII to protect the harbour against invaders, a vital defensive strategy for the development of Falmouth as a main port. Pendennis Castle was the last Royalist stronghold in Britain to surrender during the Civil War. In 1698, Falmouth introduce the first Royal Mail Packet Station in the harbour, making Falmouth the communications centre of the British Empire at this time. Small, fast, sloops darted across the oceans, carrying post and packages to Africa, America, India and Europe. The packet service brought great prosperity but once it was transferred to Southampton, Falmouth's fortunes then declined. However, its fortunes were revived again, in 1863, when the railway reached Falmouth and tourism soon followed. Falmouth is now one of the leading resorts on the Cornish Riviera. Falmouth harbour is a great place to watch the wide variety of working and sailing boats going about their business. In the days of sail, merchant ships replenished their stores at the port before making the long haul across the oceans. Occasionally you may catch the a glimpse of a tall sailing ship that has come into the harbour for repair. You can catch a local ferry from the Prince Of Wales Pier or Custom Quay, to Flushing, St Mawes or take a sight seeing trip along the Helford River. Outside the Bosun's Locker on the waterfront, stands a striking figurehead outside the ships chandlers (candle store). Near the Custom Quay is the King's Pipe, a brick chimney where smuggled tobacco, seized by Customs officials was once burned. Falmouth has several good sandy beaches; Swanpool, Gyllyngvase and Castle Beach. Ideal for swimming, sun bathing and water sports. Custom House Quay is the nautical heart of old Falmouth. These worn stone quays built back in 1670 have witnessed the growth of the town from a single manor house and a few fishermen's cottages to a bustling international port of call. In days gone by there were scores of sailors' drinking holes within easy staggering distance of the wooden ships moored alongside. Today, tourists enjoy cream teas and take river trips from these salty old quay sides. The view from Falmouth's terraces embraces the circle of green Cornish hills that protect the broad expanse of harbour, the moored lines of yachts and motor vessels and the lengthy piers of the old docks. The Parish Church, (in the foreground shown on the right) is one of the few in the county to be dedicated to King Charles I as a martyr. The award winning Maritime Museum, located near the harbour, is an oak-cladded monument, that reflects the historic wooden boat sheds common to the estuary. Among its exhibits is the national collection of over 150 historic and contemporary boats, plus interactive displays that tell the story of England's long maritime history and Cornwall's sailing heritage. It includes a below-water "Tidal Zone" with viewing ports looking into the harbour, where you can catch a glimpse of fish, crabs or passing shrimps as the tide rises and falls. A number of historic working boats are usually moored outside at the museum's pontoon, including a 100 year old Falmouth Quay Punt and a replica Cape Cod Cat boat.